ACTION: Billabong needed fresh, inventive ideas built behind their logo redesign to coordinate a global marketing campaign. REACTION: Break the mold of traditional surf ads, the action shot on an ocean blue wave, while still maintaining Billabong’s love of the iconic: the surfer style, the double-wave logo, the sport itself. 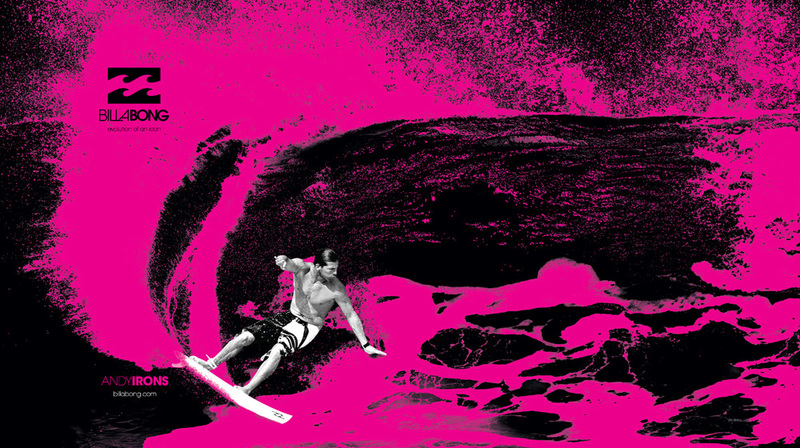 RESOLUTION: By isolating the surfer, spray, and logo within a black field I could emphasize these iconic elements. Bright, unnatural colors were used for the spray to create a stark contrast from standard surf imagery used in magazines, websites, and retail. The black and white treatment of the athlete brought balance to the highlighted elements: man, nature, and brand. Nominated for the Men's Marketing Campaign of the Year category at the 2009 SIMA Image Awards.